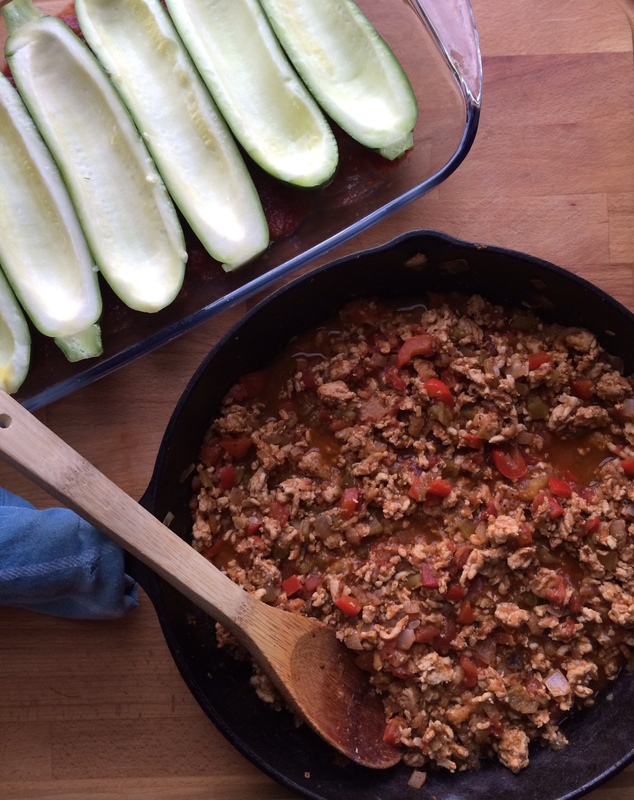 Aside from having a name that sounds like the title of an old Grateful Dead concert tour, these turkey taco zucchini (or “Zuk” if you love abbreviating like I do) boats are fun and oh so tasty. Weeknight summer dinners are all about simplicity, beauty, and the use of the freshest ingredients. Zucchini is so plentiful this time of year, so I can’t resist incorporating it into many of my meals. Obviously, zucchini is the star of this dish. Simply hollow out the zucchini using a small spoon, stuff it with an incredibly tasty turkey taco filling, top with cheese, and cook until bubbly perfection occurs. 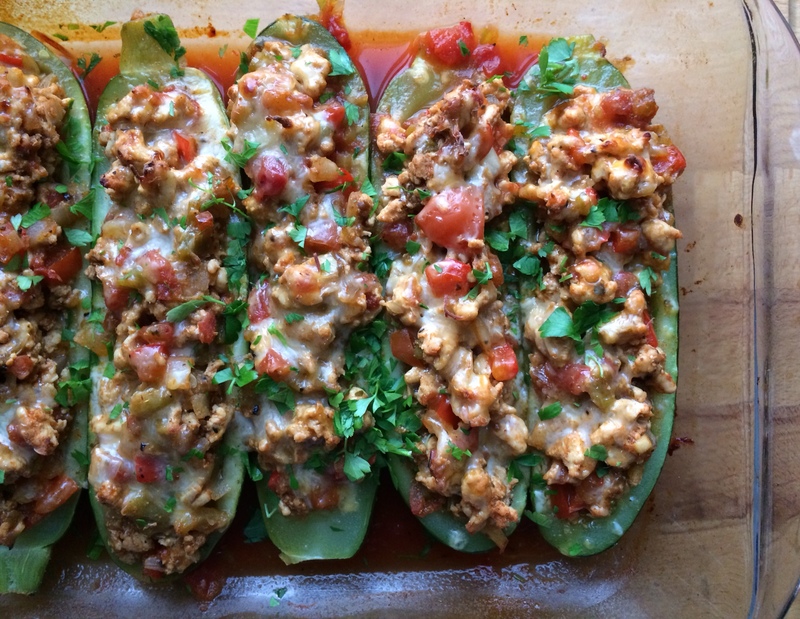 The end result is perfectly cooked zucchini and an explosion of southwestern flavors. You won’t miss the tortilla one bit. If you’re looking for a way to shake up taco night, look no further. Hop aboard the zuk-boat, and enjoy this summer weeknight gem of dinner. Healthy, delicious, pretty, and fun. Cut each zucchini in half lengthwise. Using a small spoon, hollow out the center of the zucchini halves leaving 1/4 inch border. Chop the scooped out flesh of the zucchini into small pieces and reserve 1/2 of a cup to add to the taco filling. Discard the rest or save to use in another recipe. Place the reserved zucchini into the center of a paper towel and squeeze any excess water out of it. Reserve zucchini. 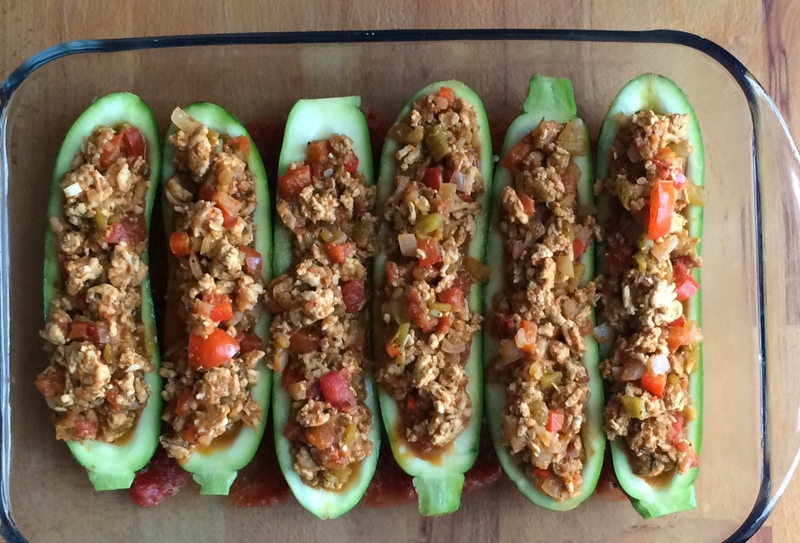 Spoon salsa into a large baking dish and place zucchini halves on top, hollowed side up. Reserve prepared baking dish. Heat a large skillet over medium-high heat and add the olive oil. Once hot, add onion and red bell pepper. Cook for 5 minutes, stirring frequently. Add garlic and cook for an additional minute. Add ground turkey and cook for 5 minutes, breaking turkey into bite sized pieces. Once turkey is browned, add reserved zucchini flesh, tomatoes, lime juice, cilantro, greed chilies, taco seasoning, cumin, dried oregano, smoked paprika, salt, and freshly cracked black pepper. Bring to a boil, then reduce heat to low and simmer uncovered for 20 minutes until most of the liquid has evaporated. Allow mixture to cool slightly. 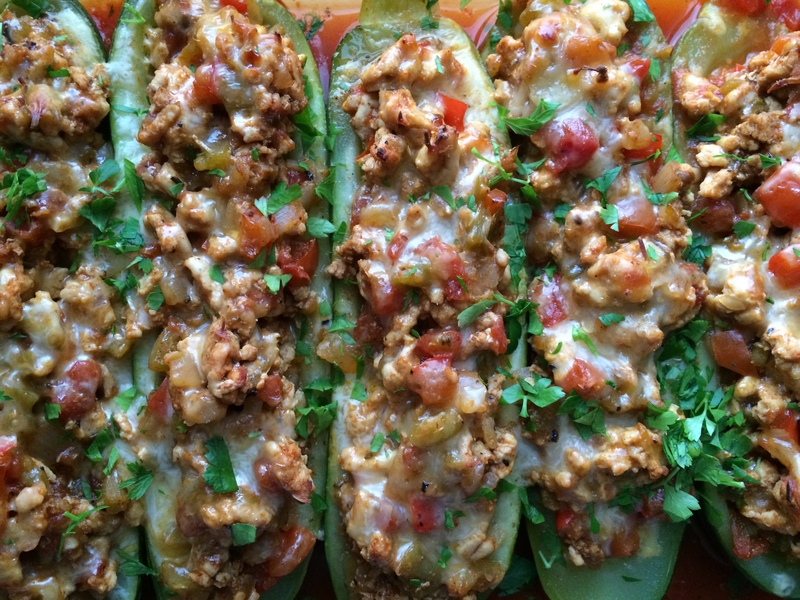 Fill the reserved zucchini boats with the taco filling mixture. 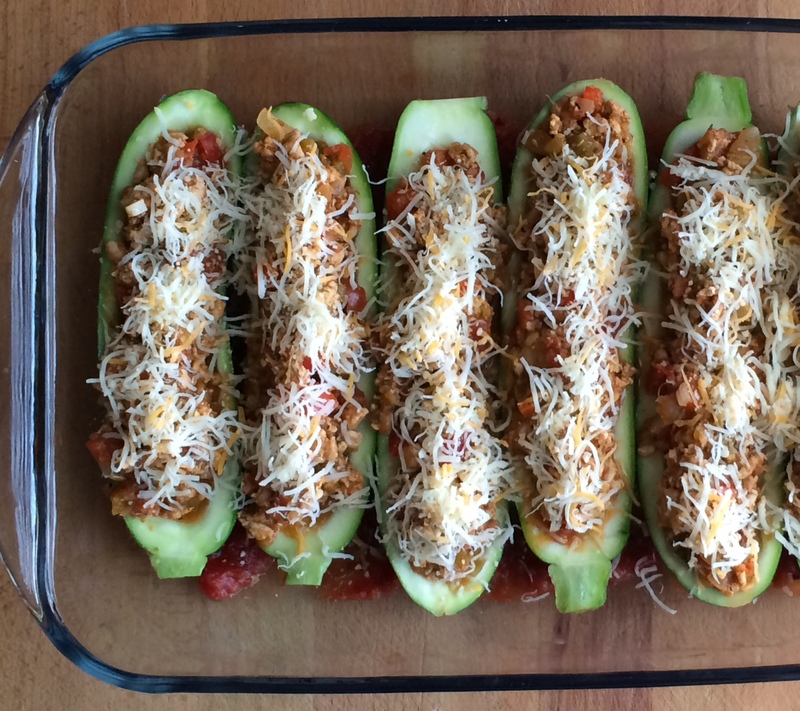 Pack as much as you can into each zucchini boat, for me that was about 1/2 cup. Top each zucchini half with 1 tbsp of cheese (I used a shredded monterey jack mixture) and bake, covered, for 35-40 minutes until zucchini is cooked through. Remove cover and cook for an additional 5 minutes.